THE IMMUNE SYSTEM – THE ONLY THING THAT PROTECTS YOU! The overall theme about the content on this website revolves around how to have great immunity by strengthening your body’s immune system. Yes the title of my website is about preventing the flu naturally without the flu shot. But in order to prevent any type of illness, all you need is a strong immune system. So how does the immune system work? Well without getting into the technical and chemical makeup of all the different reactions and processes of the immune system, I will explain how it works by focusing on 3 of the many white blood cells. Just like I mentioned in my Blog: How To Strengthen The Immune System, I will equate the immune system to that of a countries military, to make it easier to explain and understand. CAN YOU DO WHAT YOUR IMMUNE SYSTEM CAN? – NO YOU CAN’T! But first I want to ask you this question. Can you personally maintain the smooth and proper functioning of your household without ever going to sleep? Yes, I said without ever going to sleep. I already know the obvious answer is No. Now think of your immune system. It is constantly working 24/7 to maintain its household, our bodies. One more question. Can you personally maintain the smooth and proper functioning of your household 24/7 by only resting and without food? You probably could for a day or two before things started going horribly wrong. Well your immune system can do that and when you do not feed it all of the nutrients like vitamins, minerals, enzymes, proteins, amino acids and of course antioxidants, sickness is soon to follow. Eating healthy and/or taking nutritional supplements high in antioxidants, along with some exercise and restful sleep will build a strong immune system. The job of the immune system is to heal and cure you of things that go wrong with you. When you cut yourself your immune system will eventually heal you of that cut. When you are infected with a cold or flu virus, your immune system will eventually cure you of your infection. 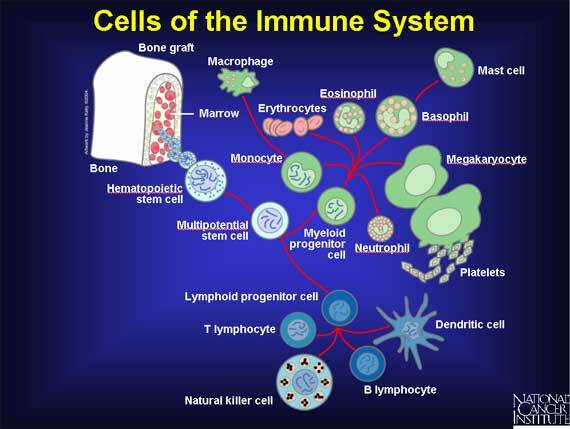 The immune system is the army of our bodies fighting battles at the cellular level to keep us well. The immune system is made up of white blood cells. Today I want to only focus on 3 types; B-cells, T-cells and NK-cells. Now let’s equate them to divisions in an army. Your B-cells are like your Infantry division, with foot soldiers that seek out invaders and use different types of weapons at their disposal to win the fight. The B-cells have many roles but one of their main jobs is to produce special proteins called antibodies. These antibodies then attach themselves to antigens (harmful cells) and stop them from attacking and mutating other good cells. Then the rest of the B, T and NK-cells can come in and kill them. Your T-cells are like your Armored division with tanks and armored personnel carriers that seek out invaders. The T-cells either directly kill them or send out a chemical instruction (known as cytokines) to the rest of the immune system. This message could be to create a specialized weapon to handle a particular type of invader. T-cells also help B-cells to make antibodies. 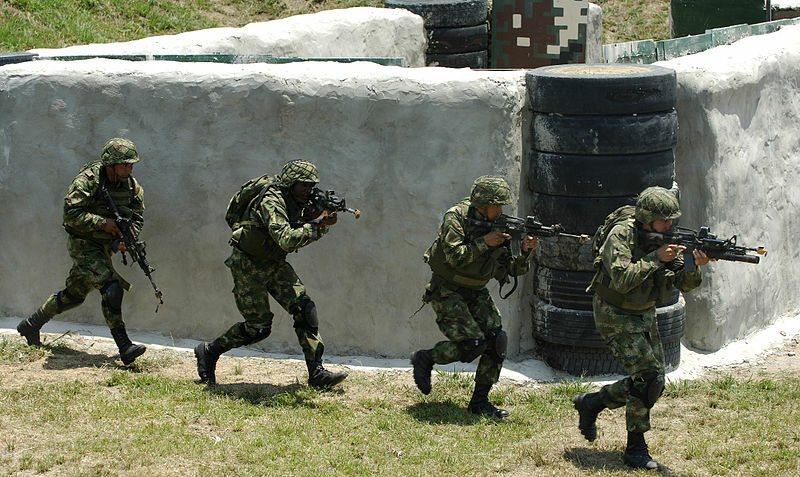 Your NK-cells (Natural Killer cells) are like your Special Forces division, with a smaller amount of troops but just as deadly as an entire infantry or armored division. Their job is simple, kill the invader or contain them until a B or T-cell can kill them. NK cells are the most powerful cell as they can kill not just virally infected cells but also tumors. This makes the NK-cell a deadly enemy of cancer cells since the NK-cell can make the cancer cell go into apoptosis or cell death. Did you know that at any given time you, me, and everyone you know have cancer cells circulating within us? You do not have to be diagnosed with cancer to have cancer cells within you. Everyone has cancer cells in them. The cancer cells are created through a variety of ways and some of the ways are natural. 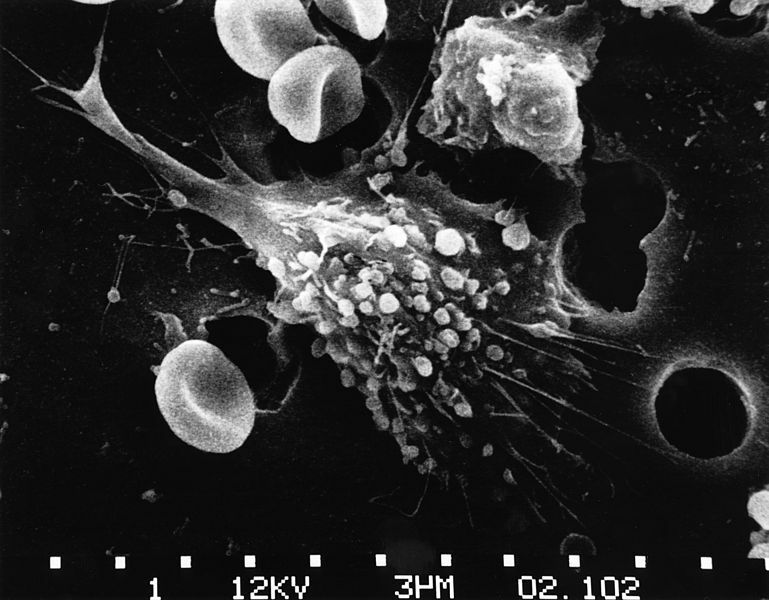 The picture above shows a cancerous tumor, which is a mass of cancer cells, being attacked by white blood cells of the immune system. Cancer cells come from mutated Free Radical cells that escaped death. Every time we inhale to breath we are creating free radical cells. Antioxidants will kill free radical cells and also support the immune system’s strength. The NK-cell is a cytotoxic cell meaning that it contains specialized protein granules in its cytoplasm. When an NK-cell targets a cell for death it will move closer to the bad cell. 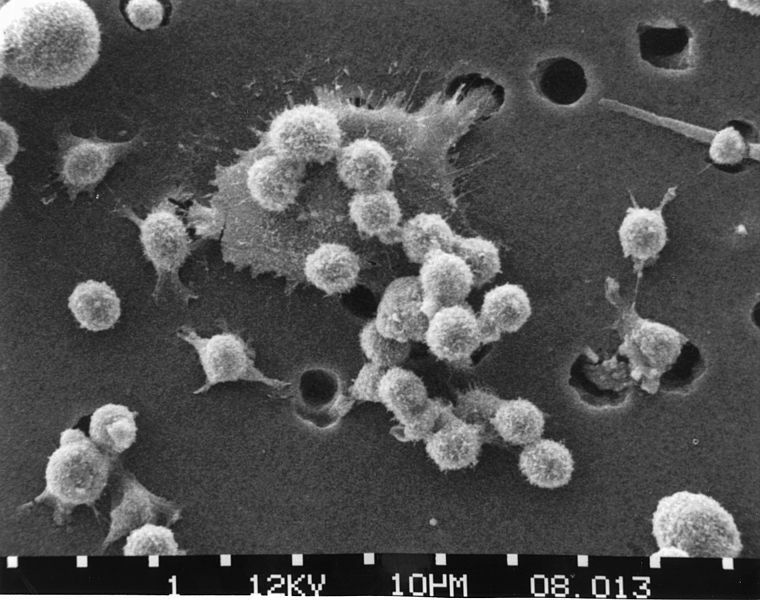 Then it will inject into its membrane these granules which in turn will cause cell death (apoptosis). Once that bad cell is dead, the NK-cell moves on to its next target. In the picture below you can see the cancer cells of the tumor in a state of apoptosis, cell death. Bye Bye Cancer cell! Getting back to the question above, you may be wondering how you can have cancer cells within you but are not diagnosed with cancer. Simple answer, the NK-cells within you can kill enough of them each and every day keeping you from getting cancer. However when your immune system becomes weak, just like a tired army, the enemy can counterattack and start to gain a foothold over your army. Between all of the smog and pollution and chemicals in our food and poor lifestyle habits, the immune system army divisions will become weaker as we age. Antioxidants to the rescue! Your body does produce Glutathione, an antioxidant but much more are needed from outside sources. This is why I take an antioxidant rich, daily multivitamin & mineral supplement every day. Make those Reserves take the burden of always fighting the war, away from your NK-cells so they can concentrate on the cancer cells. If the NK-cells are fighting too many battles without help from the Reserves, the enemy (cancer) can continue to replicate and get stronger. Eventually they will attack. 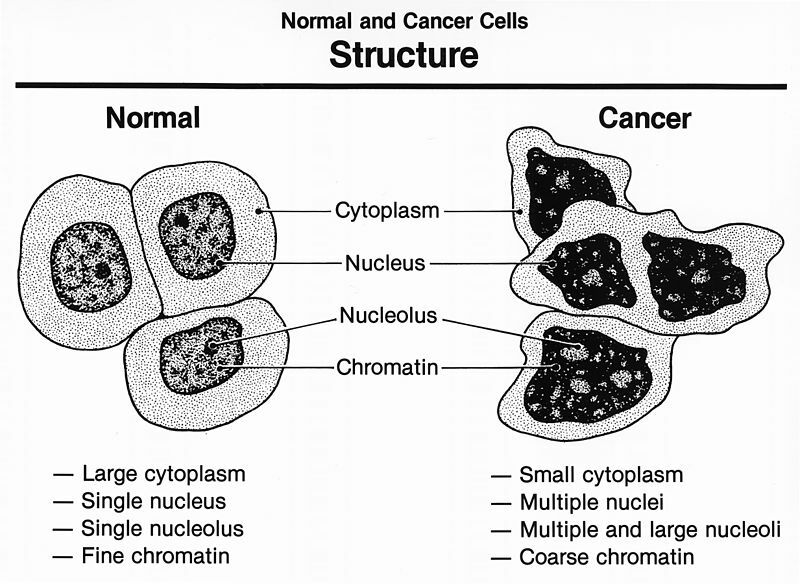 When this happens and the cancer cells outnumber the NK-cells, you are almost on the doorstep of cancer’s house. Do you now see why a strong immune system is vital to overall health? Your immune system doesn’t just protect you from the cold and flu viruses, but it protects you from getting cancer as well. But people normally do many things to weaken their immune systems. They eat a fattening diet, they do not exercise, they smoke cigarettes, they drink a lot of alcohol, they consume foods and drinks that have cancer causing ingredients, they have a lot of stress, and they do not get enough sleep. There are so many things that can make our immune system weak but there is even more things that can make it strong too. As I state on my About Me page, it was because of a strong immune system that I was able to beat cancer the all natural way. If you are not doing it already then start adopting a healthier lifestyle. Exercise a little to start then build up to more. Try taking a broad spectrum nutritional supplement with lots of antioxidants. Eat more fruits and vegetables, better yet, get a juicer and juice them. I have had a juicer for almost 20 years, well actually two juicers. I think I wore the first one out from using it so much. HaHa! But I went out and bought another one of the same brand. I’ve even come up with some tasty recipes so check them out on my Food Choices page. It doesn’t matter what healthy choice you choose. You can try them all or one or two at a time. It really doesn’t matter how many things you try to strengthen and support your immune system. The only thing that matters is that you take action and try. Please leave a comment below if you have a question or would like to share your experiences of a strong or weak immune system. I would really like to hear it. I think you have a ton of greAt information on the post I just read. But I definately think you need to consolidate your menu a bit. I don’t like to click on something and have to scroll down to see if I’m there. It’s just to much on the top of the page. I hope that helps. Keep trucking along, your doing great! Thanks Sarah, I totally agree with you. I didn’t like the way it looked either so that is why I changed it back to the way I originally had it. Smaller menu buttons with the meta title having the longer description. Yup! I totally agree. If you keep your immune system strong then you will have great immunity for not just the cold and flu but many other diseases as well. Yes, the mind has the potential to do so much in increasing health and wellness. The problem is people don’t use it enough when it comes to health and wellness by blindly following theirs doctor’s advice without questioning their doctors and/or asking for options to the dangerous drugs. – Thanks for your comment Anders.